Postural tachycardia syndrome (PoTS) is a form of dysautonomia, a term used to describe dysfunction of the autonomic nervous system. The condition can cause marked physical and cognitive impairment that can significantly impact upon activity. Although the exact UK prevalence is unknown, its frequency has stimulated an increase in studies. Occupational therapy services should place themselves in a position to respond to the potential need. This study aimed to determine how PoTS impacts upon activity, in order for occupational therapists to understand the implications of this condition and develop appropriate interventions. We recruited 201 adults (aged 18–70 years) via two patient support charities to participate in an online quantitative survey. Participants rated their experiences pre-symptoms versus present day in relation to their occupations, producing ordinal data under self-care, leisure and productivity domains, including their physical ability, motivation and fatigue levels. 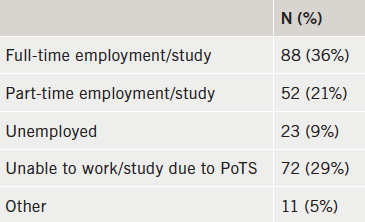 The pre-symptom versus present day probability scores of <0.001 can be viewed as ‘very significant’ and confirm that PoTS has a significant negative impact across all three occupational domains. In conclusion, PoTS has a significant negative impact upon occupation and is associated with considerable morbidity. With their understanding of the central role of occupation in wellbeing, occupational therapists may need to support people with PoTS in achieving a satisfying balance of occupations that will support their health. The current published literature base primarily explores health-related quality of life,7,8 fatigue1 and cognitive function9 among those with a diagnosis of PoTS. However, information on the extent to which these factors impact upon activities of daily living remains sparse. Consequently, there was a need to carry out a UK-based, national quantitative investigation in order to gain a scoping view. Our objective was to determine how PoTS impacts upon activity in order for occupational therapists to understand the implications of this condition and develop appropriate interventions. We hypothesised that occupation will be affected by PoTS. This hypothesis was non-directional, as there is a lack of published literature to indicate a likely direction of the relationship between these two variables. A web-based survey was selected to form the quantitative design of the study. This was hosted on Bristol Online Surveys for a period of 10 weeks and provided access to a national sample of individuals with a diagnosis of PoTS. Participants were recruited via two charity websites; STARS and PoTS UK. The survey used demographic questions in order to learn more about the target population in conjunction with Likert scales. The Likert scales produced ordinal data under three clearly defined sections: self-care, leisure and productivity. Each scale was ranked 1–5 (1=low value, 5=high value), which allowed participants to rate their experiences pre-symptoms (PS) versus present day (PD) in relation to their day-to-day activities, including their physical ability, motivation and fatigue levels. The theoretical heterarchy developed in Kielhofner’s Model of Human Occupation10 informed the development of the survey and acted as a body of knowledge to explore occupational impact. Data analysis was performed within Statistical Packages for Social Sciences (SPSS) v23. The Wilcoxon signed-rank test located change within the sample by comparing PS versus PD. Formal data analysis took place on 201 adults including 194 women (96.6%) and seven men (3.4%). The age range of the sample was vast (18–70 years) with a mean age of 32.97 years. The mean age of first symptoms reported was 23.36 years with formal diagnosis being received at 30.35 years. The average period of time between first symptoms and diagnosis was found to be 6.99 years. There were 70 participants (34.5%) who were parents compared with 133 (65.5%) who were not. Employment status is shown in table 1. Table 2 displays responses to the following question: “What is the highest level of education you have completed? (If currently enrolled, please state the level you are working toward)”. The occupational variables explored were: motivation, performance capacity and fatigue. These were considered along with the occupational domains (table 3). The PS versus PD median scores provided a significance level of p≤0.001 across every Wilcoxon signed-rank test (table 4). In addition to the self-care questions included in the study, participants were asked: “If you responded to the previous question with a number 4 or 5, do you have help to complete self-care activities from another person?” (table 5). The PS versus PD occupational scores of ≤0.001 can be viewed as ‘very significant’15 and confirm that PoTS has a significant negative impact upon motivation, performance capacity and fatigue, across all three occupational domains. Within the sample, 60 participants (37.3%) required assistance from their partner to complete self-care activities, including washing, dressing and bathing, followed by assistance from family members at 29.2% (n=47). The PS versus PD scores revealed that performance capacity and fatigue were affected more than motivation. All three variables were, however, significantly affected at the <0.001 level. There were 140 (57%) participants in some form of employment or education, while 72 participants (29.3%) were unable to work or study as a direct result of their symptoms. A large proportion of 91 participants (44.8%) were educated/working at degree level, followed by 30 (14.8%) at A-level. The distribution of responses for masters, vocational training and GCSE was equal at 8.9%. While motivation to engage in education was significantly affected, it was marginally less affected than performance capacity and fatigue. These statistics could reflect a number of possibilities. The first is that PoTS is more likely to affect younger people and younger people are more likely to be at a stage in their lives where education is considered an important, meaningful occupation. Second, education has been found to directly influence health behaviours and access to healthcare by a range of researchers.20,21 Therefore, it could be possible that educated young women are more likely to persist in their quest for answers as to why they have moved from being healthy and able to engage in a range of occupations to being limited by fatigue and reduced performance capacity. Occupational therapists recognise that many adults living with a long-term condition have parenting responsibilities. The ways in which services for adults and families are designed, accessed and delivered should ensure that the parenting role is fully supported.22 Meeting the, often, conflicting needs of a variety of parents and families will be a challenge to occupational therapy services, nevertheless, providing personalised support to parents living with PoTS and their families is a goal worth attaining. Health is strongly influenced by having choice and control in everyday occupations, and this study demonstrates that those living with the symptoms of PoTS are restricted in those opportunities. People with PoTS experience significant disruption in relation to their motivation, performance capacity and fatigue, across all three occupational domains. set, which is adaptable to multiple and complex problems, or minor coping difficulties. 26 This skill set could be utilised to facilitate people with PoTS to achieve a satisfying performance and balance of occupations that will support their health, wellbeing and social participation. Occupational therapists have the skill set to work with those who have PoTS in order to facilitate a balance of occupations that will support health, wellbeing and social participation. 4. Wilcock A. An Occupational Perspective of Health. 2nd ed. Thorofare: Slack, 2006. 7. Bagai K, Song Y, Ling JF et al. Sleep disturbances and diminished quality of life in postural tachycardia syndrome. J Clin Sleep Med 2011;7:204–10. 10. Kielhofner G. A Model of Human Occupation. 4th ed. Baltimore: Williams & Wilkins, 2008. 15. Field A. Discovering Statistics Using IBM SPSS Statistics. 4th ed. London: Sage Publications, 2014. 20. Acheson D. Independent inquiry into inequalities in health report. London: The Stationery Office, 1998. Available from: https://www.gov.uk/government/uploads/system/uploads/attachment_data/file/265503/ih.pdf [accessed 14 July 2016]. 21. The Marmot Review. Fair society, healthy lives. London: UCL Institute for Health Equity, 2010. Available from: http://www.instituteofhealthequity.org/projects/fair-society-healthy-lives-the-marmot-review [accessed 14 July 2016]. 22. Barnado’s. Parenting Support. Available at: http://www.barnardos.org.uk/what_we_do/our_work/parenting_supporting.htm [accessed 14 July 2016]. 23. Commission for Social Care Inspection. Supporting disabled parents. A family or fragmented approach? London: Commission for Social Care Inspection, 2009. Available from: http://disabledparentsnetwork.org.uk/dpndocs/supporting-disabled-parents.pdf [accessed 14 July 2016]. 24. Biordi DL, Nicholson NR. Social isolation. In: Larsen PD, Lubkin IM, eds. Chronic Illness: Impact and Interventions. 7th ed. Sudbury: Jones & Bartlett Publishers, 2009. 25. Stout K, Finlayson M. Fatigue management in chronic illness: assessment, treatment planning, and interventions. OT Practice 2011;16:16–19. 26. Hagedorn R. Tools for Practice in Occupational Therapy. Edinburgh: Churchill Livingstone, 2000.